Changing mind-sets from opportunity is nowhere to opportunity is now here. I am not a farmer. I am a people farmer, whose favorite crop is organically grown citizens. As a longtime public school educator in the South Bronx, the poorest congressional district in America, in the least healthy county in all of New York State, in neighborhoods that are densely packed with public housing, my students and I have transformed communities, schools, and lives into a luscious cornucopia that nourishes bodies, minds, and souls. We grow indoors and outdoors, with big, burly teenagers and the most adorable little farmers you’ll ever meet. We’ve planted flowers, shrubs, and trees to beautify our communities. We’ve grown enough produce to send fresh food home with hundreds of students and donate even more to shelters and kitchens serving our most vulnerable families. By connecting our green projects with the curriculum, the seeds we plant during the school day germinate academic results and open career paths that forever change the trajectory of my students’ lives. I grow vegetables, but my vegetables grow students, schools, opportunities, and lives. How does the simple act of teaching children to plant seeds lead to better health, stronger academic performance, and more hopeful communities? How have we managed to grow so much goodness and opportunity in a community challenged by environmental degradation, high crime, chronic disease, and generational poverty? And just how fast can we bring this remarkable program to other communities that are desperately seeking solutions? I’m eager to share the answers and inspire others to fire up their own green machines. I’m a proud Bronx native who stumbled into teaching over thirty years ago by happenstance, only to discover that I had a passion and knack for engaging the hardest-to-reach students. But it took a classroom accident, two decades into my teaching career, for me to discover the power of a plant to delight, nurture, and inspire curiosity in everyone from tattooed gang members to wide-eyed tots. Along the way, with passion, purpose, and hope, I’ve learned some critical lessons and a few handy metaphors about greening the classroom and growing something greater. It all starts with soil. Our communities are our soil. If a plant is going to thrive, it needs to take root in a healthy growing medium. The same goes for students. The best soil for growing young minds and bodies is a thriving, supportive community. In the Bronx, like so many communities around the world, our soil needs to be respected, refreshed, replenished, watered, and tended. Seeds come next. I tell my students that they are my seeds, and they are packed with potential. My goal is to plant those seeds in the most fertile setting possible so that they are able to cultivate their talents and realize their dreams. I am determined to grow something greater with the greatest natural resource in the world: the untapped human potential in low-status communities. Then comes the harvest. My students’ efforts have yielded more than fifty thousand pounds of vegetables, along with improved attendance, reduced disciplinary issues, better academic results, increased health outcomes, and the immeasurable joy of sharing that bounty with others. We cook what we grow, too, in classrooms where the distance from farm to table is measured in footsteps. By following my own advice about healthier eating, I’ve lost more than a hundred pounds. A former junk food eater, I’ve even developed a taste for arugula and eggplant. I’d be lying if I told you that I started with a grand plan to transform public education. None of this happened overnight. My ultimate journey to create a living, thriving, green classroom took some time. In fact, I like to say I’m one big mistake! But my secret is, I keep falling up the ladder of success. My own Bronx boyhood allowed me to cultivate deep connections to a community that others were all too ready to write off. When I started teaching at age twenty-one, I had no idea that I would go on to design a program to inspire learning and community change. My outgoing personality was useful for engaging teenagers, but then what? To really reach the students who were not being well served by public schools, I had to do some serious learning myself. That took time, too, but I’ve leveraged everything I learned along the way to build what we now call Green Bronx Machine. There’s been a lot of surprising turns, setbacks, and heartbreak but also many unexpected partnerships. I call these collisions, connections, and co-learnings. When I bump into interesting people or come across ideas that inspire new possibilities, I’m eager to learn together. That’s how we create a multiplier effect. 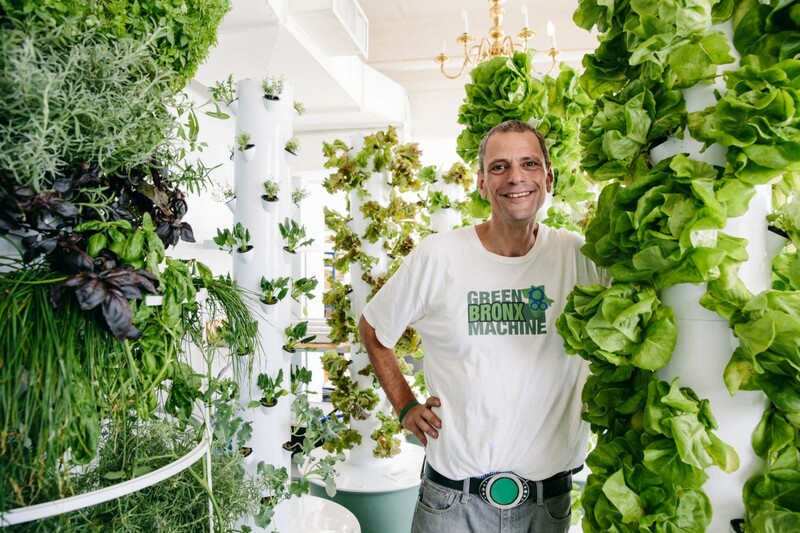 From our classroom Tower Gardens to our Green Bronx Machine Mobile Classroom Kitchen, we’ve reaped immeasurable benefits by staying alert for opportunities and then adapting fresh ideas to work in our classroom. I’m the first to admit that I don’t always know what’s going to work. I’m determined to find out, even if I have to fail a few times to get to good answers. That’s the story of my life: shifting attitudes from impossible to I’m possible, changing mind-sets from opportunity is nowhere to opportunity is now here. When I started teaching a lifetime ago, my goal was to be one person who could make a difference in the lives of young people. So I’m humbled by the accolades and attention that I have received. More profoundly, I am uplifted by the resilience and spirit of the young people who have grown up to be productive, contributing, and caring citizens. They make me Bronx proud. Knowing how many other communities are hungry for solutions, I want what we’ve done to inspire others to plant new seeds to grow something greater. My odyssey is proof positive that if you show up, grow up, and are willing to work hard, amazing things can happen. Passion, purpose, and hope are my secret sauce, and these ingredients are free to all, no purchase required. Root your feet in the ground and extend your head to the sun. As we say daily, Sí se puede, and make epic happen! Excerpted from THE POWER OF A PLANT by Stephen Ritz Copyright © 2017 Stephen Ritz. Published by Rodale.